199, Jalan Bukit Bintang, Kuala Lumpur. STAYING true to its roots, Qba Bar & Grill’s UOB Chef’s Creation set dinner is a three-course meal featuring a play of Latin tastes that tempt the palate. The menu started off with some crunchy, fresh grilled asparagus accompanied with sour hollandaise sauce to whet the appetite. Delighted: Wong (left) and Westin’s new kitchens director Garth Welsh proudly showing off the main courses for the dinner set. 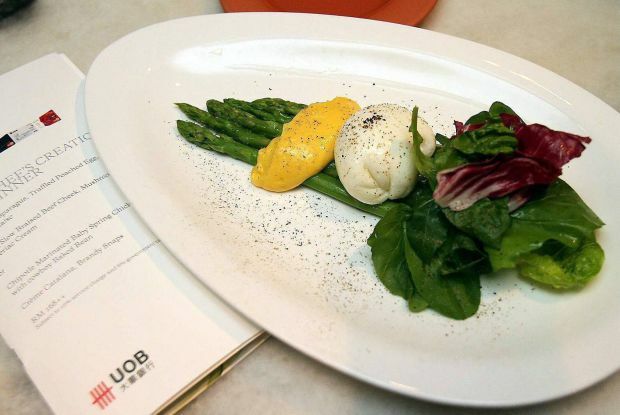 It also has a truffled poached egg — runny yolk with solid white — with a salad on the side. As for the mains, you can choose to have the Slow Braised Beef Cheek, Mushrooms with Celeriac Cream or the Chipotle-Marinated Baby Spring Chicken with Cowboy Baked Beans. Junior sous chef Wong Soon Yaw said the beef was braised for about 12 hours to give it a tender texture while retaining its juices. The accompanying celeriac (celery root) cream still has hints of fresh celery and complemented the rich flavour of the meat well. As for the spring chicken, Wong said many wondered if the beans came from the can. “We actually cook our own cowboy beans in a homemade sauce that includes apricot, turkey ham and barbeque seasoning,” he said. The chicken itself has a smoky flavour with a pleasant spicy aftertaste. Wong said baked beans were very big in Latin American cuisine. To end the meal, he presented the sweet Creme Catalana and Crunchy Brandy Snaps which contained no alcohol despite its name. “Think of this as a Spanish version of the French creme brulee. The Spanish, of course, had a very big influence in South America. “I used dishes that were very popular with our diners during our daily specials for this set dinner. We have been receiving positive comments so far,” he said. UOB cardmembers can enjoy the set for two at RM168++ from now until Dec 30.